Blizzard are still deciding whether or not to support Diablo III: Ultimate Evil Edition with post-launch patches. One of the best things about Blizzard games is the steady stream of free, content patches. From Starcraft to Warcraft to Diablo, when you buy a Blizzard game, you can usually expect a plethora of post-launch support in the form of bug-fixing, content-adding patches. 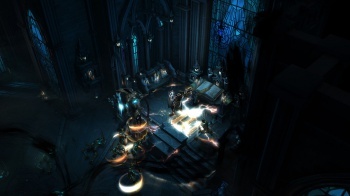 However, those of you eagerly awaiting Diablo III: Ultimate Evil Edition for the PS4, PS3, Xbox 360, and Xbox One may not be in for the same treatment Blizzard's PC playerbase has come to expect. "We're still working out all the details regarding if and how Ultimate Evil Edition will be supported post-launch," said Blizzard poster Grimiku on the official forums, adding "E.g. will we patch the game after it ships? if yes, should we only patch to fix bugs and address critical game issues, or should we patch in new content as well? at what frequency should we patch?" He did confirm, however, that when the Ultimate Evil Edition ships on all platforms, it will include all of the updates from the PC version up to patch 2.0.5, and that there will likely be a "Day 1" patch to add in patch 2.0.6 content, too. Currently, a rather substantial 2.1 patch for the game's PC version has been deployed on the Public Test Realm, which introduces new features such as Greater Rifts, Laddered Seasons, and Leaderboards - features console gamers may never see. This doesn't bode well for those who prefer to mash rather than click, but can be somewhat expected considering Blizzard likes to give away post-launch support for free, and developers have had a hard time convincing Sony and Microsoft to let them give away free content in the past.